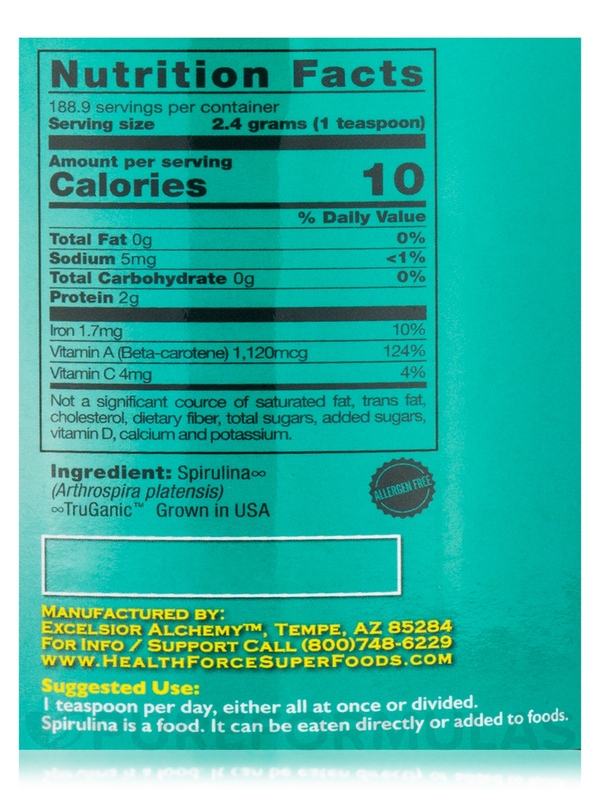 Spirulina Manna Powder by HealthForce Nutritionals is an excellent source of protein. Spirulina Manna works perfect in my morning smoothie - along with about 9 other powdered supplements mixed in apple juice. love Spirulina Manna Powder by HealthForce Nutritionals ! and love this company! thx also to pure formulas for the good price and speedy and free shipping! Stimulate your immune system and support healthy kidney function with Spirulina Manna™ Powder from HealthForce Nutritionals. This vegan protein powder may also keep blood glucose levels within a healthy range and reduce stress. Spirulina is a blue-green alga that provides chlorophyll‚ antioxidants‚ proteins‚ vitamins and other nutrients to your body. It could potentially boost immunity and fight cold‚ flu‚ and infection. Studies reveal that spirulina offers antioxidant protection to the cells of your body‚ combats inflammation‚ and improves eye health. 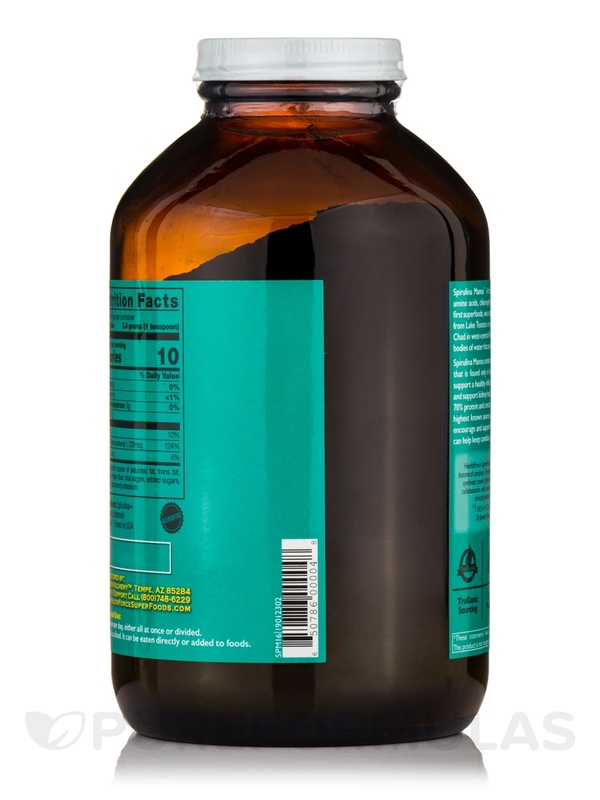 Spirulina in this health supplement from HealthForce Nutritionals may promote the growth of good bacteria in your digestive system and improve the absorption of nutrients from foods. It could potentially maintain healthy bowel movements and detoxify your body. Spirulina reportedly increases blood hemoglobin levels‚ supports heart healthy living‚ and boosts cognition. Incorporate Spirulina Manna™ Powder from HealthForce Nutritionals in your daily diet and it may increase energy levels and metabolism to keep you healthy and active all day. Note that none of the Healthforce products contain inner seals, only seals around the lids. % Daily Values based on a 2‚000 calorie diet. Take 1-6 (or more!) heaping tablespoons per day. All plastic containers (more so in soft plastic) release gases during the aging and degradation of a material. The volatile organic compounds (VOCs) released from plastic negatively affect our health. 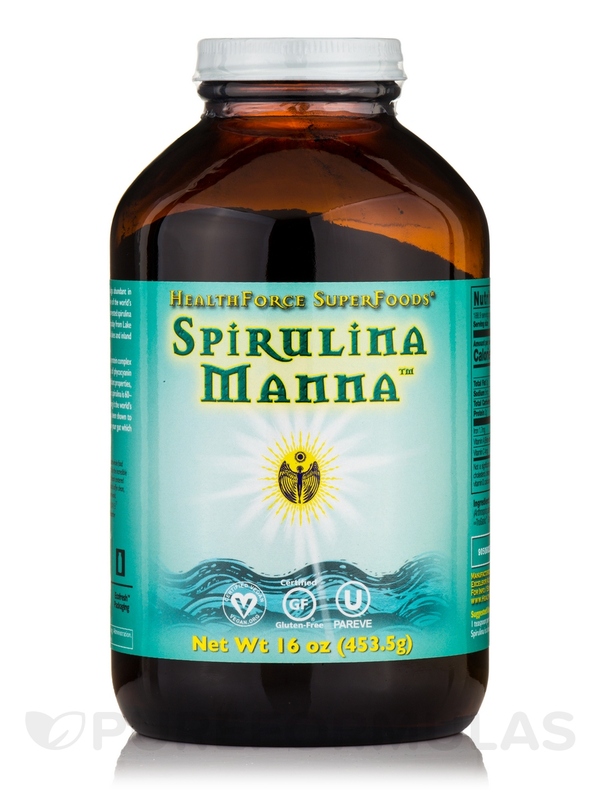 When I first ordered Spirulina Manna by HealthForce Nutritionals it was out of stock. Got an email notification several days latter that it was available and I got on-line an ordered it immediately. Been using Spirulina Manna for several years along with another green product. Haven't been sick once since taking it. Good cost for the amount. It was sold out when I first tried to reorder. As a competitive runner I am always looking to fuel with the best of the best. Ive done extensive research on this company and truly believe that the quality is superior to any other brand of Spirulina. I can feel a NOTICEABLE difference in my energy and more importantly my recovery from hard runs when I eat this. I simply put 30 grams (yes thats a lot!) in a blender with ice water and stevia and drink up every night! 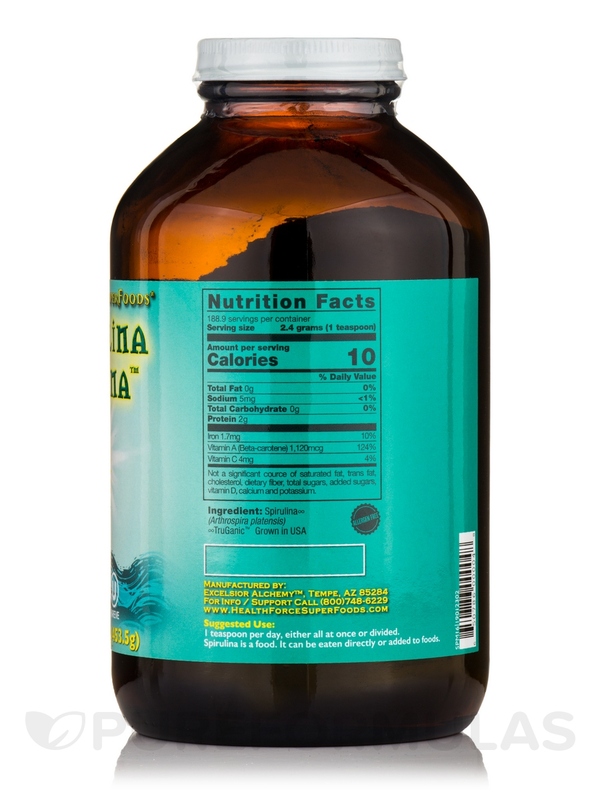 I realize there are some difference between Health Forces Spirulina Manna and Azteca but they seem slight to the average greens user like myself. My main product I use is the same companys Vitamineral Greens but it is about 20% more than this product. I definitely believe the greens are a source of my energy so I use them regularly and this product is high on my list and I trust the company that produces it. Spirulina Manna is the best tasting and most balancing form of protein Ive ever found. Its natural protein with beneficial minerals and vitamins. Highly recommended! I always feel terrific after I take this. Spirulina Manna is from a trusted company. The best tasting spirulina I have ever used! 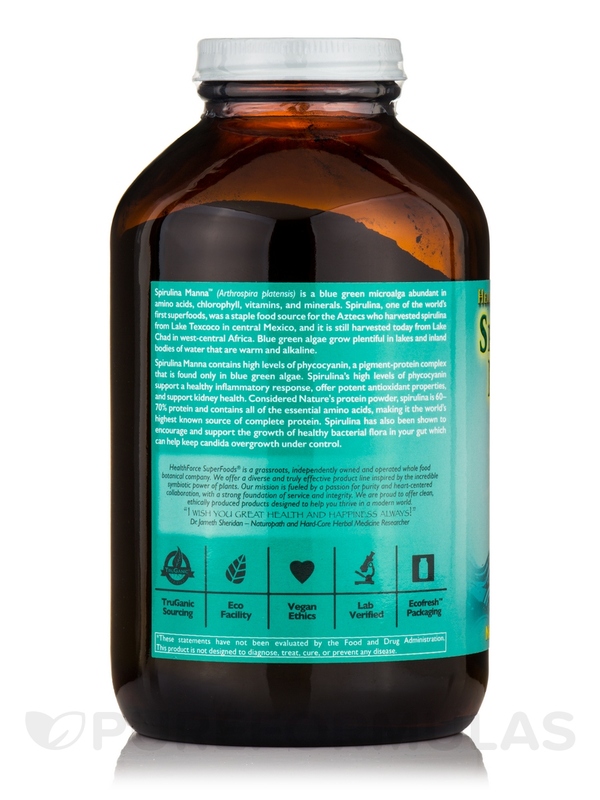 Spirulina Manna has iodine an essential mineral. I love the free shipping! I love Spirulina Manna! It is from a company I trust! The taste takes some getting used to if youve never had it before but soon youll be adding in to everything. I usually put Spirulina Manna in my breakfast and shakes/juices. It gives me a lot of energy. Spirulina Manna is a super food! I bought Spirulina Manna for my son who is very active. It is easily and quickly absorbed into the system giving great energy. Mixed with water or better with a smoothie.